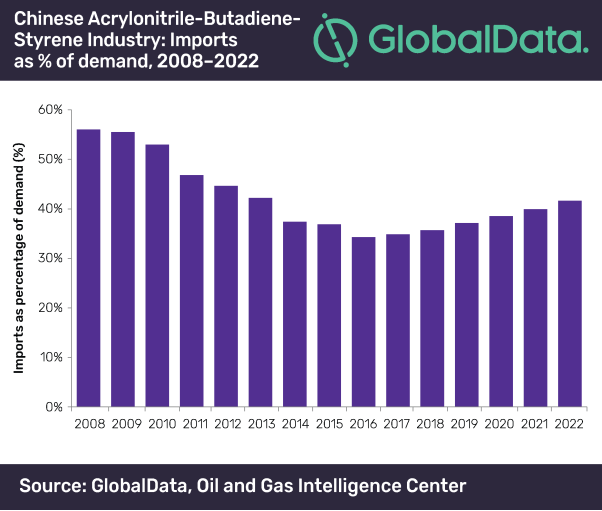 China will continue to be a net importer of Acrylonitrile-Butadiene-Styrene (ABS) until 2022, primarily due to growing demand from the household appliances, electrical and electronics, automotive and industrial sector, says GlobalData, a leading data and analytics company. The company's report, ‘Acrylonitrile-Butadiene-Styrene (ABS) Industry Outlook in China to 2022 - Market Size, Company Share, Price Trends, Capacity Forecasts of All Active and Planned Plants', forecasts that imports of ABS are expected to increase at a compound annual growth rate (CAGR) of 7.2% from 1.790 million tons per annum (mtpa) in 2017 to 2.531 mtpa in 2022. According to the report, ABS plant capacity in China is expected to increase from 3.730 mtpa in 2017 to 3.880 mtpa in 2022, at a CAGR of 0.8%. The largest ABS plants in China are Ningbo LG Yongxing Chemical Company Ningbo ABS Plant, Formosa ABS Plastics Ningbo ABS Plant, Zhenjiang Chimei Chemical Zhenjiang ABS Plant 2, Jilin Petrochemical Company Jilin ABS Plant 2, and Tianjin Dagu Chemical Company Tianjin ABS Plant. The country's major companies are Chi Mei Corp, China National Petroleum Corp, Formosa Plastics Group, LG Chem Ltd and Tianjin Daxie Chemical Co Ltd. Together they accounted for 77.3% of the ABS capacity in 2017.